The Spring View Select 6879CT Mobile Home Floor Plan offers 1,680 square feet of living space. This home is a 32' wide version of Model #6679CT. This is just one awesome floor plan. 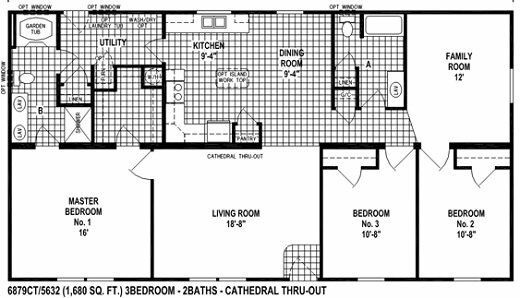 If you have a larger family the family room can be built as a 4th bedroom or you could even build it as an office, if you work at home like I do a lot. This house has been very popular. It features a mud room that you can come in from outside and go right to the laundry room or the bathroom. The bath features a walk in shower and you can put a corner tub option in it. The Master Bedroom features a huge walk-in closet so you have plenty of space here too.